Rescuers and salvage workers have concluded a frantic search for victims in Bangladesh's Rana Plaza, an eight-story garment factory complex that collapsed on April 24, killing an estimated 1,127 people. Sadly, there will be no more miraculous stories of survival like that of Reshma Begum, the 19-year-old seamstress who was pulled from the rubble 17 days after the collapse. Instead, the United Nations and leading experts like Muhammad Yunus are urging the international community to address this catastrophe's underlying causes. The tragedy in Bangladesh was the world's deadliest industrial accident since the 1984 Bhopal disaster in India, and the deadliest in the history of the garment industry. Yet considering the UN estimates that Bangladesh's garment industry employs three to five million workers, the chances of more accidents like this occurring appear high unless adequate measures are taken. In fact, there was another factory incident even more recently -- a fire that killed nine people. That is why the UN Working Group on business and human rights is calling upon global clothing companies to vastly improve working conditions in Bangladeshi factories. "We strongly urge international clothing brands sourcing from Bangladesh to address human rights risks in their supply chains with the involvement of workers, other relevant stakeholders, and human rights experts, and to share publicly what they are doing to mitigate their risks," said Pavel Sulyandziga, the head of the five-expert Working Group, which the Human Rights Council established in 2011. The disaster has prompted thousands of Bangladeshi workers to march through the nation's capital of Dhaka -- not far from the industrialized suburb of Savar, where Rana Plaza was located -- forcing hundreds of factories to close. Meanwhile, the international community has shared this outrage, criticizing retail giants for conducting business in one of the world's most impoverished countries. Pope Francis even described working conditions in Bangladesh as "slave labor." Such negative publicity has led to international corporations like the Walt Disney Company announcing they are pulling production from Bangladeshi factories. Yet the Working Group is imploring these businesses -- which helped create Bangladesh's flourishing but unregulated garment industry -- to utilize their unique position and upgrade conditions, both for workers and factories alike. The Working Group is recommending massive collaboration between western corporations, the Bangladeshi government, civil society groups and international organizations to establish an infrastructure and standards regarding worker safety and welfare. 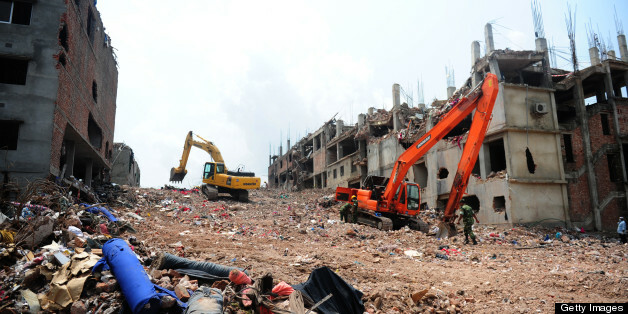 While the Rana Plaza complex apparently had been audited, the building's structural issues were either ignored or omitted. The building itself had been constructed illegally and reportedly revealed large cracks in the days prior to the collapse. On the morning of the collapse, such visible cracks even made workers reluctant to enter the building. Moreover, the auditing system that major clothing companies utilize has been widely criticized. By contrast, the Working Group is strongly recommending that the global garment industry adhere to the UN Guiding Principles on Business and Human Rights. Such principles clearly state the obligations that businesses and governments have for the well-being of workers. According to Sulyandziga, "Human rights due diligence helps business understand better their impact on human rights throughout their value chains." He added, "The UN Guiding Principles also spell out what to do when risks are discovered: identify your leverage and ability to work in partnership with other businesses, local authorities, workers and civil society to work towards sustainable solutions." The Working Group's recommendations echoed the sentiments of Muhammad Yunus, the 72-year-old Nobel laureate who hails from Bangladesh and founded the Grameen Bank there three decades ago. "For Bangladeshis, the tragedy at the garment factory in Savar is a symbol of our failure as a nation. The crack that caused the collapse of the building has shown us that if we don't face up to the cracks in our own systems, we as a nation will get lost in the debris," Yunus wrote last week in an impassioned editorial in The Guardian. "Today, the souls of those who lost their lives in Rana Plaza are watching what we are doing and listening to what we say. The last breath of those souls surrounds us." Yunus cautioned international firms against leaving Bangladesh, maintaining it would lead to complete social and economic failure. "This industry has brought about immense change in our society by transforming the lives of women," said Yunus. "We cannot allow it to be destroyed." Not only is Yunus asking foreign corporations to remain in Bangladesh to improve working conditions from within, but he is also urging these businesses to help create an international minimum wage for factory workers. "This might be about 50 cents an hour, twice the level typically found in Bangladesh. This minimum wage would be an integral part of reforming the industry, which would help to prevent future tragedies," Yunus contended. "We have to make international companies understand that while the workers are physically in Bangladesh, they are contributing their labour to the businesses: they are stakeholders. Physical separation should not be grounds to ignore the well-being of this labour." The vast majority of Bangladesh's exports­ -- 80 percent -- come from its $18 billion garment industry. However, according to the World Bank, Bangladesh ranked last in wages for factory workers worldwide in 2010. What would this mean for western consumers who have benefited from Bangladesh's cheap labor? Yunus believes establishing a minimum wage would amount to only miniscule increase in product cost. "Would a consumer in a shopping mall feel upset if they were asked to pay $35.50 instead of $35? My answer is no, they won't even notice," Yunus said. "If we could create a Garment Workers Welfare Trust in Bangladesh with that additional 50 cents, we could resolve most of the problems workers face -- safety, work environment, pensions, health care, housing, their children's health, education, childcare, retirement, old age and travel. Everything could be taken care of through this trust." Amazingly, upgrading factory conditions might not even cost that much. As ThinkProgress reported recently, the Worker Rights Consortium estimates that adding a mere 10 cents onto the price of the seven billion garments that Bangladesh exports annually would generate more than enough funds to overhaul factories and install proper safety equipment. And as for how this minimal surcharge would impact buyers -- if such a conversation can be had when discussing conditions for Bangladeshi factory workers still reeling from this tragedy -- Yunus believes buyers would be even more willing to purchase an article of clothing knowing that the company manufacturing it could guarantee its workers well-being. "Consumers would be proud to support the product and the company," Yunus concluded, "rather than feeling guilty about wearing a product made under harsh working conditions."